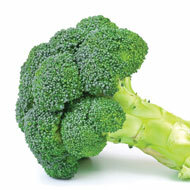 Broccoli is the answer to osteoarthritis! Well, we all knew we should eat our greens, but we didn't know it would be this important! It has been discovered that an enzyme released when eating cruciferous vegetables such as sprouts, cabbages and particularly broccoli, can ease the symptoms of Osteoarthritis! Sadly it is the process of digestion that makes the compound that blocks one of the osteoarthritis enzymes, so in order to make it work we would have to eat a lot more than anyone would desire. So a pharmaceutical company has managed to make a synthetic version that is stable and so one tablet would be the equivalent of eating 2.5kg of Broccoli. We always love hearing about new ways of treating osteoarthritis and we really hope to see a cure one day. Osteoarthritis affects nearly nine million people in the UK, costing the NHS over £5 billion a year. Other than pain relief and joint replacement, there is currently no effective treatment or cure. The RVC's professor of skeletal dynamics, Andrew Pitsillides said there is "massive" potential for SFX-01. Human trials are already well under way, so keep eating your carrots so you don't miss the news when broccoli tablets are officially on the pharmacy shelf!